Morning: You take taxi by yourself to Can Tho airport to flight to Da Nang City (you will be at airport 1 and half hour before departure flight). Arrive in Da Nang, we will pick you up from airport and transfer you to hotel for check-in your suitcase at hotel if you arrive in Danang before noon time. 4:15pm: Visit the carvings-stone village where the local skillful sculptors create many marble products which are exported to many countries worldwide. 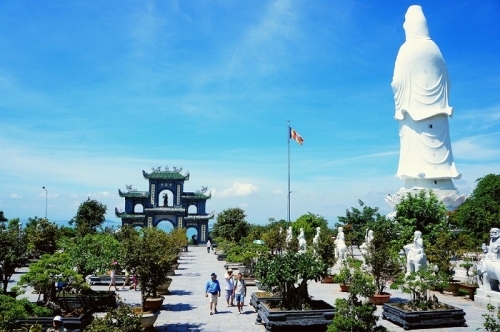 Climb up to visit the Marble Mountains by the stone stairs and enjoy the panoramic view of the nearby countryside, visit Huyen Khong cave, and visit Linh Ung pagoda. 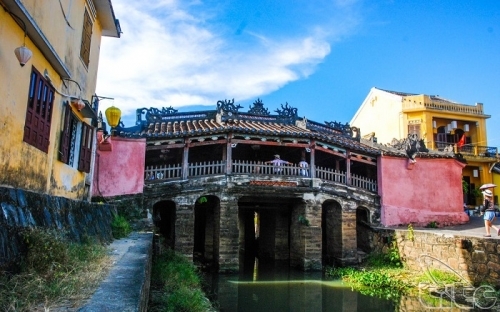 7:30pm: Visit Hoi an Ancient town: The Museum of History, Quangdong temple, The Chinese Assembly Hall of Phuc Kien, Japanese bridge, Phung Hung Old house, Thang Loi handicraft workshop. Included: Pick-up airport from Danang, entrance fees, English speaking guide in tour, 01 water bottle, dinner and accommodation in Danang. Excluded: Other meal, air ticket, drinks, travel insurance, tip and personal expenses. Have a breakfast at hotel and check-out hotel in Danang. 07:30am - 08:00am: Our tour guide will pick you from your hotel and depart to Ba Na hills. 09:00am: Arrive in the Suoi Mo cable car station. Sitting in the cabin, in mid air, looking upon the endless tree lone of the forest. Experiencing the pristine ecological system of the Ba Na mountain will leave you a sense of unforeseeable discovery. 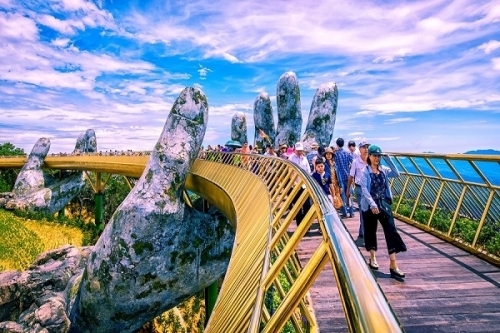 09:30am: Visit The Golden Bridge - The shimmering structure emerges from the trees of Thien Thai garden in Ba Na Hills. Set more than 1,400m above sea level, the bridge incorporates eight spans and extends 150m-long. The bridge is supported by giant hands. Visitors will really feel like stepping into paradise when they walk on the bridge. 10:00am: Visit the Le Jardin; beautiful flower garden (entrance fee included – free of charge for walking, 70,000vnd fee for tramway, old wineries (entrance fee included – if you enjoy/taste wines here, you will pay 45,000vnd per glass of red wine and 75,000vnd for glass of white wine) - remains of French Villas and Linh Ung pagoda with 27m high Buddha statue. 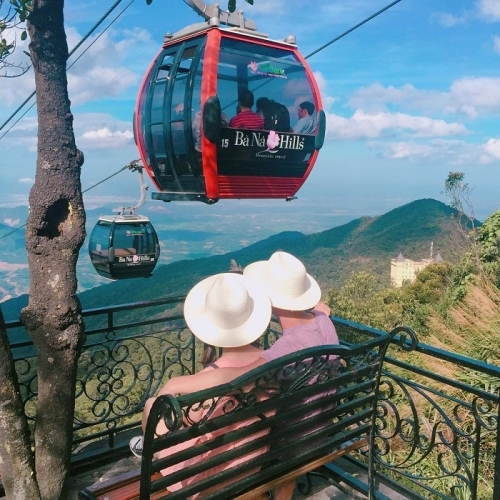 Leave Le Jardin for Gare Debay, the second cable car station, to go to the top of Ba Na. 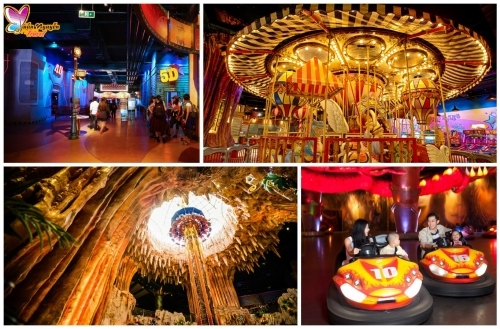 11:00am: Visit and play game at the Fantasy Park - Ba Na Hills Fantasy Park- the third largest indoor amusement park in the world (free games but except wax showroom, teddy picker game and skill game). 13:00pm: Conquer the Peak of Chua Mountain at the height of 1,487m. Leave Peak of Chua mountain, passing the Suspension Bridge. 15:00pm: Return to cable car station and depart to hotel in Hoi An. 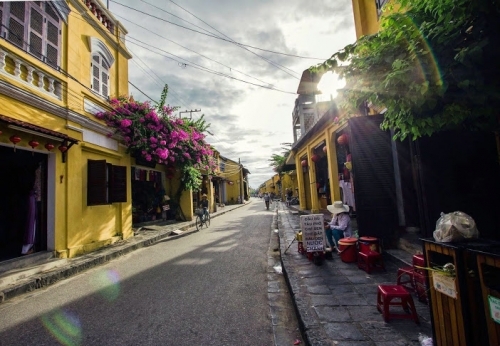 Included: Coach, English speaking guide in tour, breakfast at hotel, lunch, entrance fees, 01 water bottle and accommodation in Hoi An. Excluded: Tip, drinks, dinner, travel insuarance and personal expenses. Free time until private car will pick you up at hotel and transfer to domestic airport flight out. Finish Danang - Ba Na Hill - Hoi An Ancient Town Tour and see you again. Air ticket: Can Tho - Da Nang & Da Nang - Can Tho.